Writer, adventurer and three-time Guinness World Record holder Dan Buettner recently spent some time studying the ecologically challenged Galápagos Islands. Here, from his journal, are some impressions. f you go to the Galápagos Islands looking for excitement, you've made a mistake. Don't get me wrong; things happen fast here. Evolution, for example, happens faster here than perhaps anyplace else on earth. Darwin finches have evolved into 13 different species in record time. Then again, that took many thousands of years. The wildlife here is awesome! Where else can you see sofa-size tortoises, dinosaur-faced marine iguanas and birds with blue feet that look like rubber flippers? The first time you see these marvels of nature, you're floored. You ogle, then shoot off a couple rolls of film. The second time you see them you glance and take a picture. The third time, which could very well happen on your first day, you shrug and think to yourself, "Yep, another 500-pound tortoise ... when's lunch?" We've been to six islands in our effort to retrace Darwin's route. Each of the islands offers some combination of essentially the same famous animals  sea lions, flightless cormorants, penguins, tortoises, blue-footed boobies and marine iguanas. Sure, animals vary somewhat from island to island. For example, marine iguanas of Española are red, while on other islands they're black. They still look the same, though. To all but a science teacher, the differences might not mean much. But they do help tell a big story  the story of evolution. Yet to someone like me, who favors fast mountain biking over bird watching, day after day of incredible animals tends to inspire, well, yawns. Then something happened. We stopped at Punta Espinosa on Fernandina Island. It is the best place to view flightless cormorants in the Galápagos. But, since I've seen about 200 flightless cormorants already, I sat out the tour. I found a comfortable rock and waited for the rest of the team. Five, 10, 15 minutes passed. I looked down at the porous volcanic rock under my shoe. It reminded me of the pumice that my grandma used to scrub corns off of her feet. I wonder if it came from here? I thought. I suddenly noticed a lava lizard sitting right next to me. It had been there the whole time, sitting motionless, exquisitely camouflaged, awaiting some unsuspecting insect. How did it get to be the exact color of the lava instead of say, hot pink? Trial and error? A moment later, a Sally Lightfoot crab swam out of the sea and skittered past me. It ran sideways with the grace of a ballerina. All eight legs moved independently, yet in harmony with all the others. What incredible coordination, I thought. Does it have to think about moving each leg or does that just happen? 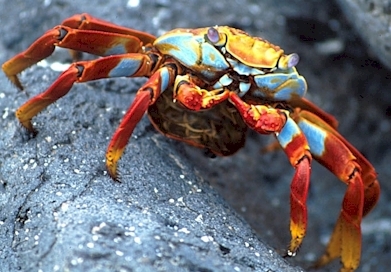 The crab settled near the waterline of a nearby rock. Using its spoon-like foreclaws, it began shoveling in algae and munching it up with its multi-part mouth. It looked like a hungry kid devouring a bowl of Lucky Charms with a spoon in each hand. Being a bit of a kid myself, I tried to grab the crab. He darted backwards into a crack. I, of course, reached in. The critter snapped down on my finger with hydraulic strength. I wrestled my bloodied finger out of the crack and knelt down to confront my opponent. He hunkered down, pincers open, ready for another attack. I looked him right in the eyes, which sat on top of his head like tiny marbles. He stared me down, and won! I retreated to my rock. A few moments later, the rest of the team came back, bragging about the pictures they got of yet more sea lions, marine iguanas and, yes, flightless cormorants. "What did you see?" they asked. "Oh, nothing," I replied, knowing that I wouldn't be able to explain my simple but fascinating encounter with the crab. After all, these crabs litter the rocks. Visitors pretty much ignore them. It occurred to me that much of the magic of the Galápagos  or anyplace  is in the minutiae, the tiny details. I happened to be watching crabs, but it could have been ants in Arkansas, worms in Washington or caterpillars in California. In the critter world, small miracles occur every day. The gift that the Galápagos has given me is the patience to slow down and witness them. E-mail Dan, visit his Quest Network Web site and find more of his work in our archives.